Several years ago, a friend who helped me to find my way around the Russian State Archives in Moscow asked if I would like to meet another woman who was also working there. She was not doing research for a book, and she was not a scholar. Instead, she was indulging her curiosity and her nostalgia. Forty years earlier, she had worked as a baby nurse in a children’s home inside one of Stalin’s labor camps. Now she wanted to find out what had happened to some of the people she had known there, to jog her memory of names and dates. A meeting was arranged, and we talked for perhaps an hour—without a tape recorder, because she wanted to remain anonymous. In the course of the conversation it became clear that she had in fact sought me out. Our mutual acquaintance had told her that I was an American writing about the Gulag, and she wanted to make a few things clear. Most of all, she wanted to impress upon me how clean and orderly had been the children’s home, and to tell me how happy the children had been within its walls. She also wanted me to know that these children’s mothers were criminals who were all too happy to abandon them, that the nurses and caretakers had saved them from a terrible fate. She had even brought a photograph, which she gave to me. The picture showed a group of children standing around a holiday tree, with neatly dressed caretakers in the background. I looked at the picture, and agreed that yes, the children were not starving, and yes, the caretakers did look professional in their white uniforms. But there was a problem with the photograph: all of the children in it were dressed alike. All of them had shaved heads. They were not smiling. And thus the effect of the photograph on me was precisely the opposite of what the former nurse had intended. The children looked exactly like little prisoners—which, in fact, is what they were. Their nursery lay within the perimeter of the zona, the prison zone, and would have been surrounded by mud and barbed wire. Yet the former Gulag nurse was unwilling, or unable, to see the horror of this. I looked at the picture and saw sad children, growing up in a terrible place. She looked at the picture and saw the greatness of the Soviet state, which took care even of the children of criminals. Of all the odd things about the Soviet Union, perhaps the oddest was the way in which official propaganda—which told people what the world was supposed to look like—so often triumphed over everyday experience, which revealed that things were different. In this case, by “official propaganda” I do not mean the vague fibbing that goes on during the election seasons of mature democracies. Soviet propaganda was blared from radios and televisions, posted on walls, printed in newspapers, repeated at party and Komsomol meetings. It was constant, it was repetitive, it was specific. During Stalin’s lifetime, it could be very dangerous to contradict any of it in public, and many people were afraid to do so in private as well. Yet some people believed it, or wanted to believe it, or reckoned it was a good idea to believe in it. And thus it was not ineffective. When the propagandists said that Soviet citizens were becoming ever richer and better fed, many people were inclined to think that this could be true, even though they themselves lived poorly and badly. When the propagandists said that factories were booming and the harvest was successful, some people accepted this too, even though industrial products were unavailable and bread was rationed. And when the propagandists said that all Soviet citizens should thank Comrade Stalin for their happy Soviet childhood, many could not refuse this either. Even if they knew from personal experience that not all Soviet childhoods were happy, they could imagine that some really had been. This strange relationship between real life and official fiction is one of the central subjects of Children of the Gulag, a significant and sickening book, which contains several different kinds of documentary evidence, as well as commentary. Much of the archival material here was published in Russian, in a volume (Deti Gulaga 1918-1956: Dokumenty) edited by Semyon Vilensky, one of this book’s co-authors. For that volume and this one, Vilensky also supplied some memoir material from the private archive of Vozvrashchenie (“Return”), an organization which he founded, and which is dedicated to the preservation of the memory of Stalin’s victims. Cathy Frierson, the other coauthor, has added some new material—notably interviews with survivors and with the children of survivors. This combination of sources allows Vilensky and Frierson to show the stark contrasts between official policies toward Soviet children and their actual experiences. The book’s scope is broad: the word “Gulag” in the title is here used as a general term for the Soviet experience, and Children of the Gulag is really a history of Soviet policy toward children. As a result, Frierson and Vilensky touch upon an ambitiously wide range of subjects: children of political prisoners, children of collectivized peasants, children of deportees, as well as children living and working in labor camps. They also describe many different eras—not only the Stalinist period but also the revolution, World War II, and the post-Stalinist period. They keep returning to the stark contrast between public image and private reality, which was a fact of Soviet life from the very beginning. One of the first public discussions of child policy in the Soviet Union was launched in 1924 by Nadezhda Krupskaia, the widow of Lenin, who made a public appeal on behalf of homeless children. As a result, more than 650,000 people joined the “Friends of Children Society,” a charity dedicated to that cause, and Krupskaia became its public face. At that time, there were thought to be some 80,000 children living on the streets of Moscow. More than 200,000 children were living in various kinds of orphanages. All of them had lost their parents to revolution, civil war, terror, and famine, and the conditions in which they lived were often horrific. Yet even as she appealed for more resources, Krupskaia was defensive. She was not a critic of Soviet orphanages. On the contrary, her instinct was to praise them—not because they were good or clean, but because they were Soviet. While not denying that some of them were lacking in basic facilities, she declared that “our children’s homes are under public supervision, [and] this alone protects them from a series of pedagogical errors.” Talking to a foreign journalist, she also made excuses: “We are building socialism … and as long as we are building socialism but have not yet built it, we will also have homeless children.” She even went so far as to denounce a phrase then in wide use. Soviet orphanages, she said, were not “angel factories,” or places where children went to die. This phrase had been used in the czarist era as a description of foundling homes for poor children, but it was not appropriate any longer, now that the foundling homes had been nationalized. “We have no angel factories,” she stated categorically. We have meat rarely, and then only a little bit. The bread is rye, we haven’t seen sugar for three months. The little ones can’t hold out, they gather potato peels and eat them. Sometimes, because there’s no produce, we boil porridge, it’s something like pig slop…. Children wear the same underwear for months, and sometimes even longer, without taking them off, because they have nothing to change into. They heat up the bathhouse two times a month, and even then children wash without soap, so that children are getting parasites. There is no bed linen, there are mattresses but not cleaned for a year, the blankets are in shreds, teeming with lice. Not all of the requests were on paper. One woman approached Krupskaia at an official reception and told her that the arrests of her daughter and her son-in-law had left two small children without parents. Krupskaia told her that she could not do anything about the daughter, but would happily try to find a place for the woman’s grandchildren in an orphanage. “Give up your own children to an orphanage,” the woman snapped. This was a harsh insult, since Krupskaia famously had no children of her own. The grandchildren in question experienced no repercussions. But neither did Krupskaia, the self-designated defender of children, ever help them. Half the cell had become hysterical. I covered my head with a shawl and experienced an overwhelming desire to cry out too, “My Shurik, my Ellochka!” But I bit my hand until it bled, covered my ears and closed my eyes. The Zakgeim family story illustrates also another theme central to Frierson and Vilensky’s work: the manner in which the Soviet state came to treat whole families as “enemies.” Once again, official policy on this subject was perfectly clear. In 1935, Stalin declared that “a son should not answer for his father,” and this phrase was often repeated by party and Komsomol leaders. In practice, however, Stalin treated the designation “enemy of the people” like a genetic disease: if one family member was “guilty,” then others would be as well—and of course children would inherit the same suspicious genes. It often happened that husbands, wives, and children were arrested at the same time—sometimes to be followed later by brothers and sisters and cousins. In the late 1930s, special camps were set up for wives of Enemies of the People. In the 1940s, Polish and Baltic families were deported and forcibly resettled in villages—fathers, mothers, grandparents, and grandchildren all together. But if children were guilty, then it followed that some of them must be imprisoned. That is why, alongside the hundreds of thousands of children in Soviet orphanages, there were also children living in actual labor camps—not the metaphorical Gulag of this book’s title, but the literal one. They lived behind barbed wire, served out sentences, and worked as forced laborers. In 1944, Lavrenti Beria, the head of the Soviet secret police, proudly informed Stalin that the Gulag’s juvenile camps had contributed impressively to the war effort, among other things producing mines and grenades. Not all of the children in the camps had themselves received sentences. Some arrived as infants, along with their mothers, like the woman who wrote to Krupskaia begging for two pairs of tights. A number of memoirists describe the horror of finding themselves inside a cell with a nursing mother—though it was even more horrible to be in a cell with a nursing mother who had been separated from her infant during arrest. And many children arrived in the camps because they were born there—living proof that the strict rules prohibiting contact between male and female prisoners (and between female prisoners and guards) were not observed. Unwanted though they might have been, the children’s presence was officially acknowledged, and the Gulag’s central bureaucracy at different times sent various instructions to camp commanders designed to ensure that they “grow up and develop normally,” some of which Frierson and Vilensky have included. According to one particularly chilling directive, “toys which are not spoiled by washing and boiling, made of rubber, celluloid and bone, shall be permitted.” According to another, breastfeeding “shall take place for 20-30 minutes according to a schedule set by the nursery doctor. At these times, the wardens shall bring the imprisoned mothers from their cells to the nursery.” Anyone who has ever cared for an infant will know just how difficult such a “schedule” would have been to keep, and will not be surprised to learn that under those circumstances children died of starvation and neglect, even before they were sent away from their mothers. Krupskaia may not have liked the expression “angel factories” to describe Soviet orphanages, but the term is entirely appropriate to many nurseries within the camps. But there were also children and teenagers who found themselves in the special juvenile labor camps, or even in adult camps and prisons, because they had themselves been arrested. These were often Krupskaia’s orphans, who had grown up to become pickpockets and thieves. Solzhenitsyn describes them as totally amoral, having “no concept of good and evil,” and other memoirists write about them with equal horror. In the juvenile camps, they formed gangs and sometimes beat up the staff. In the adult camps, they often served as mascots and errand boys for the older criminals. Even then, this fifteen-year-old could not prevent himself from writing what he believed to be true. Following his arrest, he wrote a letter to Stalin, in which, among other things, he quoted the founder of the Bolsheviks: “Lenin said, ‘In the Soviet nation there should not be any unfortunate children. Let there be young happy citizens.’ But am I happy? No.” For voicing these kinds of opinions, Moroz was condemned to a labor camp, despite being underage. He died there soon afterwards. His story contains its own moral: Moroz had dared proclaim that official propaganda was not reality, and that all Soviet childhoods were not happy. He paid the ultimate price. 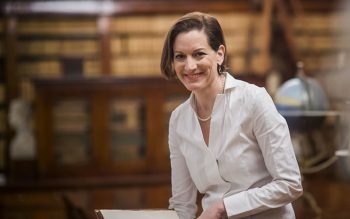 Anne Applebaum is a columnist for The Washington Post and Slate, and the author of Gulag: A History (Doubleday). Can the Brits learn bipartisanship?